Hi Ariel! Tell us a little bit about yourself. Hi! I’m Ariel Adkins, an artist and designer based in Brooklyn, NY. I make clothing inspired by art from all different genres, mediums, and eras. I guess you could say I am an art superfan! 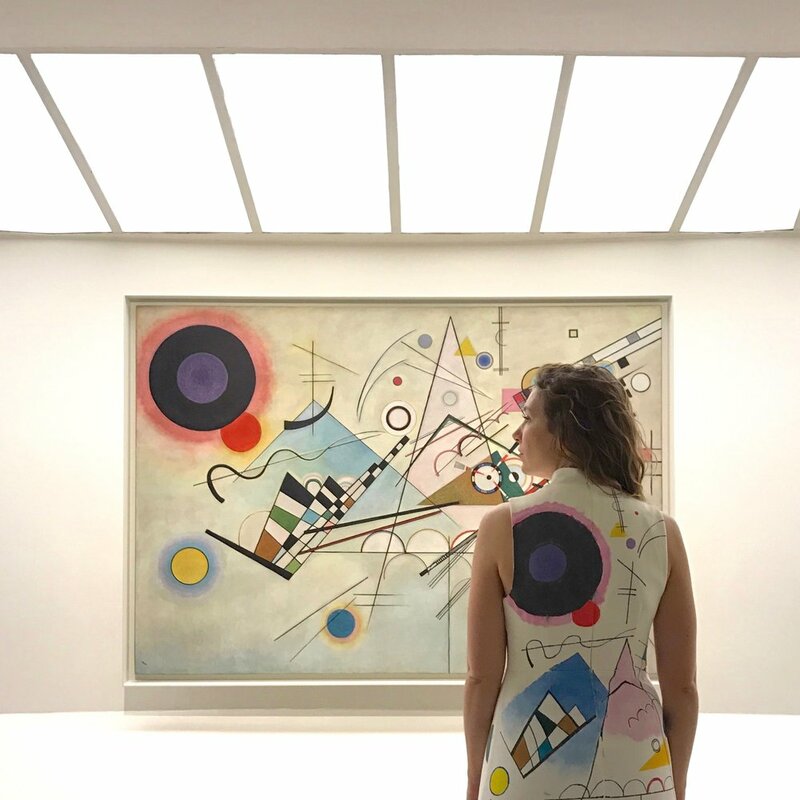 What draws you to art and to clothing? What made you want to combine these passions? For as long as I can remember, I’ve loved clothing and enjoyed dressing up. My mother was an artist and always encouraged me to think outside the box, so in some ways it was a natural progression to combine the two. When did you begin making your own clothes? I made my first art-inspired garment in 2013, a hand-stenciled dress for the Christopher Wool retrospective at the Guggenheim in NYC. When making your pieces, do you draw the inspiration from art pieces that you've seen in real life or do you also make pieces inspired by only pieces you've seen photos of? More often than not, I don’t get to see the artwork in person until I’m there to shoot photos of my garment and the piece together! It’s always a bit risky working from photos, because colors and textures aren’t always captured with verisimilitude. Additionally, I don’t think there is any way to recreate the experience of engaging with artwork in real life. It changes everything. What is your process of making your clothing pieces? Do you find plain clothing and then paint your creation or do you design and hand make the garments? I typically work on second-hand garments, hand-painting and embellishing them. I’ve sewn a few pieces as well, but I like the idea of taking something that was a cast-off and giving it a new life as something beautiful. You recently launched your first capsule collection! How did that process begin and what steps did you take to make that a reality? A friend, the artist Miljan Suknovic, approached me about an exhibition he was doing at a boutique in SoHo, and asked if I’d like to be involved. The boutique, Dreams on Air, agreed to give us the space to do an art and fashion installation and to host an opening party. 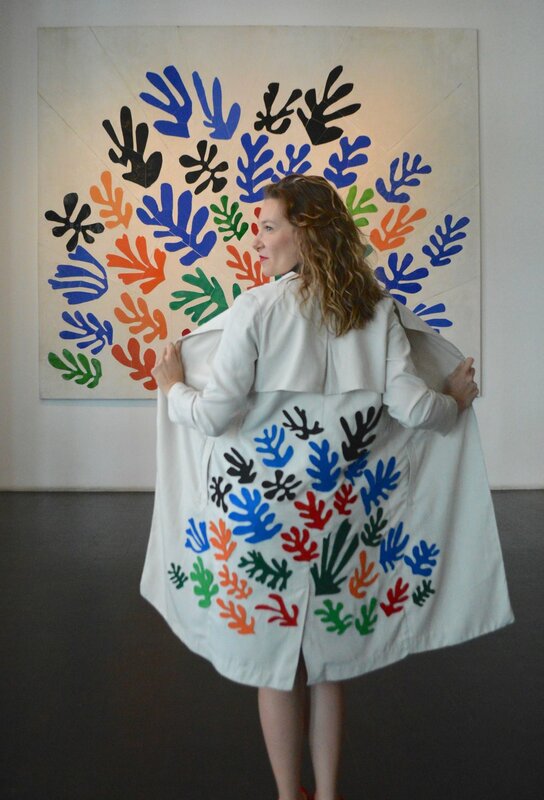 From there, I got to work creating one-of-a-kind garments inspired by Miljan’s artwork. At the opening, some of my close friends modeled the clothes, and we even had a photo booth where you could dress up in AA clothing and take photos matching Miljan’s painting in the background. The evening culminated in a live painting performance, where I painted my friend Luiza as she was wearing a white dress. It was so much fun! All of the hand-painted clothing pieces were sold, which was a nice outcome. I adore the Brooklyn Museum and Brooklyn Botanic Garden, and frequent both of them very often!! I buy all of my art supplies at the Artist & Craftsman in Gowanus and love visiting the Textile Arts Center for inspiration. My favorite restaurant is Talde and I love shopping at Beacon’s Closet in Park Slope.